If we begin at the eastern border of Libya with Egypt this morning and move west, we find the country is now divided in two, with the east largely in the hands of dissidents and the West still under the thumb of Qaddafi’s security forces. The border with Egypt is in the hands of the Youth Movement, and the Egyptian government at the Bedouin village of Sallum (pop. 14,000) is allowing the border to remain open, permitting supplies and medicine to flow into the eastern cities. This Egyptian policy is tacit support for the revolt. Then Tobruk is in dissident hands, with what soldiers there are having joined the revolt and now directing traffic and keeping order for the new, civic leadership. 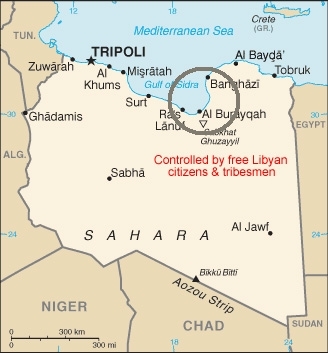 Tobruk, a city of 300,000 (about 5% of Libya’s population), is the last major stop in the east on the way to the Egyptian border. Aljazeera Arabic is showing footage of the Libyan military command in the district of al-Jabal al-Akhdar declaring its allegiance to the protest movement. This Arabic news article confirms that report and gives further details. Does this news mean that the capital of the district, al-Bayda, has fallen to the Youth Movement? On Tuesday, wire services were reporting that al-Bayda (pop. 200,000) was still in the hands of Qaddafi loyalists, despite fierce fighting between protesters and foreign mercenaries in Qaddafi’s employ. An eyewitness said that the mercenaries had committed a massacre in which 26 were killed in al-Bayda. (Update: Aljazeera Arabic is reporting at noon Wednesday that al-Bayda and Dirna are now outside the control of Qaddafi forces and that the east of the country is pretty uniformly in rebellion. At the level of the central government, Qaddafi’s cabinet continued to collapse on Tuesday. He had already lost his minister of justice. He has now lost his Interior Minister, Abdul Fattah Younis al Abidi, who very publicly resigned from Benghazi and complained that Qaddafi had told him of plans to use fighter jets against the civilians of Benghazi. Hours later reports surfaced that al Abidi had been kidnapped by gangs in Benghazi.